With professional baseball heading into its post-season and the football season just beginning, fans across the country are gathering regularly for game day get-togethers. Whether watching the game at home or tailgating in the stadium parking lot, one of the most important elements is the food. As temperatures start to drop, the competition is heating up. Whether you’re a baseball or a football fan, tailgating season has begun. To help spice up your game day spread, chef Curtis Stone is sharing some of his favorite recipes for tailgating parties. An easy-to-use ingredient that amps up any game day menu is the Hass avocado, which is available year-round and can be identified by its dark, pebbly skin that generally turns from green to purplish-black when ripe. While it serves as the main ingredient in guacamole, its creamy texture also is a perfect topping for just-grilled meats, sandwiches, salads and more. To help fans pull together quick and delicious food for their parties, chef Curtis Stone, host of TLC’s ‘Take Home Chef’ and author of ‘Relaxed Cooking with Curtis Stone: Recipes to Put You in My Favorite Mood,’ is sharing some of his recipes that are perfect to eat while watching the game. Stone likes to keep recipes simple and let the food speak for itself. His game day recipes for ‘Grilled Cilantro-Lime Shrimp with Spicy Hass Avocado Purée’ and ‘Grilled Bacon and Buffalo Mozzarella Sandwiches with Hass Avocado’ are easy to prepare and combine delicious flavors that every fan is sure to enjoy. These recipes feature the Hass avocado—always in season, Hass avocados are available year-round, so you can use these recipes throughout the fall and winter, well into playoff season. 1. Add the avocado, lime juice, sour cream and jalapeño to a blender and purée until smooth, scraping the sides of the blender as needed. 2. Season purée with salt to taste. 3. Place in a covered airtight container and refrigerate until serving. 1. In a large mixing bowl, combine the lime juice and zest, cilantro, cumin and oil and whisk well. 2. Add the shrimp and toss to coat. 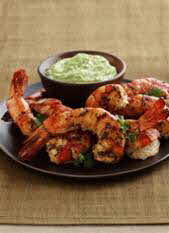 Do not marinate shrimp longer than 5 minutes or the lime juice will begin cooking the shrimp. 3. Preheat a barbecue or grill pan to medium-high heat. 4. Season the shrimp with salt and pepper to taste and grill for 2 to 3 minutes on each side or until lightly charred and cooked through, making sure not to overcook the shrimp. 5. Remove the cooked shrimp from the grill and place on a serving platter, with a small serving bowl of the Spicy Hass Avocado Purée. Garnish the shrimp with fresh sprigs of cilantro and serve. 1. In a food processor, purée the garlic into a coarse paste. Add in the basil, pine nuts and cheese; mix until combined. 2. Slowly pour in the oil and add in the avocado and lemon juice until combined. The pesto should be smooth, but have a thick consistency. Season the pesto with salt and pepper to taste; set aside. 1. Brush the outside of each piece of bread lightly with the oil, and lay the bread out with each half facing up. 2. Divide the Hass Avocado Pesto between the slices of bread and spread evenly. 3. In a shallow bowl, dress the avocado with lemon juice and season with salt and pepper to taste. 4. Season the tomatoes with salt and pepper to taste. 5. On the bottom half of each slice of bread, place even amounts of half of the mozzarella, tomato, avocado and bacon; and then place the remaining mozzarella on top of the bacon. 6. Place the tops of the bread onto the sandwiches and press firmly. 7. Place a sandwich in a pre-heated sandwich press. 8. Cook until the bread is toasted golden brown and the cheese has melted, about 7 to 8 minutes. 9. Repeat with remaining sandwiches. 10. Cut the grilled sandwiches in half, arrange on a platter and serve immediately. * Large avocados are recommended for these recipes. A large avocado averages about 8 ounces. If using smaller or larger size avocados adjust the quantity accordingly. Recipes created by chef Curtis Stone for the Hass Avocado Board. Copyright © 2009, Curtis Stone. 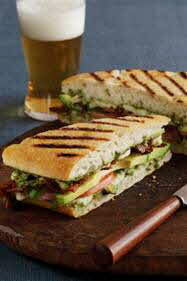 For more game day recipes that feature Hass avocados, visit the Hass Avocado Board’s Web site at www.avocadocentral.com. The Hass Avocado Board (HAB) was established in 2002 after approval by producers and importers of Hass avocados in a national referendum. A 12-member Board administers the program. Over 20,000 producers and 100 importers are involved in the HAB, which covers fresh domestic and imported Hass avocados sold in the U.S. market.